It sometimes feels like we did not have a summer this year. You can expect me to gripe about this a lot in the near future as it gets colder and colder. The ‘summer’ we did have was ghastly and awful and rained all the time in the months when the sun was supposed to shine and there were supposed to be thunderstorms and now its freezing bloody cold and it’s still mostly raining. I am not a happy bunny. In such circumstances one is forced to abandon all attempts at salad eating and get down and dirty with some slow cooked something something. In my case it’s slow roasted lamb. I love lamb in its many many forms but I mostly love it when it’s been slow roasted with tender loving care (in this case, my tender loving care). I love the sticky-ness of the meat, the way it all falls apart; the almost feral need to tear it from the bone with one’s fingers in a way reminiscent of ancient man. Okay, so I am getting carried away and poetic. The other brilliant thing about slow cooked lamb is that you bang it in the oven and leave it to get on with things for a number of hours. This frees you to do various things, not limited to but including: wine drinking, book reading, DVD watching, and general trash talking with friends. There are obviously many ways to slow cook lamb but for this particular evening I have chosen dear Jamie. Jamie is my source for all things basic. Curry? Tart cases? Tart fillings? Pies? I use Jamie in his various incarnations a lot. This is recipe actually comes from an Olive magazine (April 2011) and is from Jamie’s Jamie Does book which is one I don’t actually own but covet regularly in various bookshops. 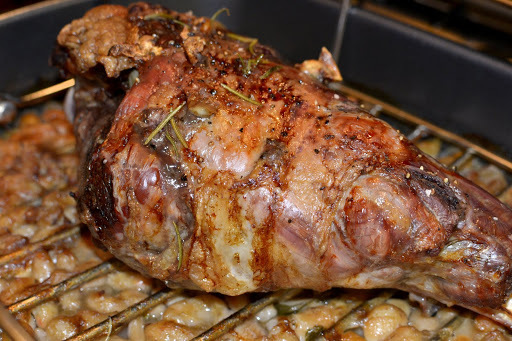 The recipe is for lamb with beans, a decidedly French version and doesn’t contain any mint. (I’m not the biggest mint sauce fan for reasons mainly relating to the mint sauces’ exceedingly long life span in the fridge-it’s the jar that gets taken out once a year and then returned where things of unknown nature I’m sure breed on it invisibly.) 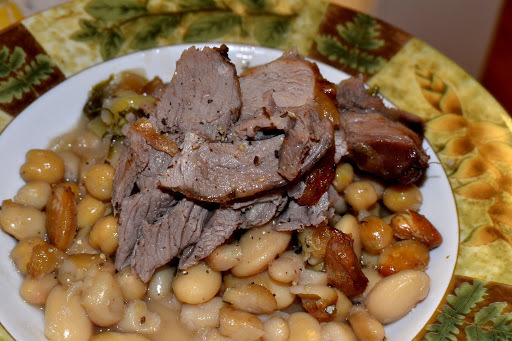 Anyway, the genius of this recipe is that you cook the lamb over the beans. This results in all the lovely lamb juices falling down into the beans and creating the most wonderful bean accompaniment thing. Salt and pepper the lamb, rub it with olive oil and stab it all over with a small paring knife. Insert the thyme and rosemary sprigs into the holes. Slice one of the garlic cloves and pierce these into the lamb too. 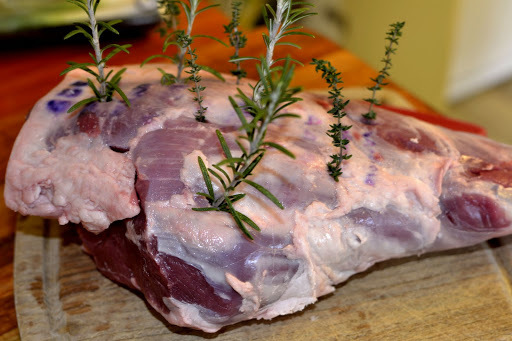 Place this on a rack that will fit over your roasting dish. Slice the leeks and onions, peel the other garlic. Place in a roasting tray and cook over a low heat until the onions and leeks have softened. Add in the beans with the can juices, the bay leaves, some extra thyme and the parsley. 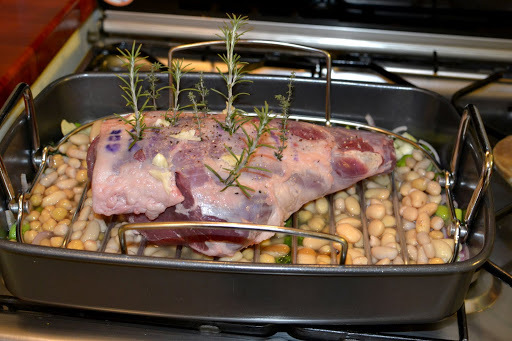 Place the lamb on top of the roasting tray and put in the oven. *Jamie uses flageolet beans because this is a French recipe. I had no such thing so used 1 can of chickpeas, 2 of butter beans and 1 can of cannellini beans.